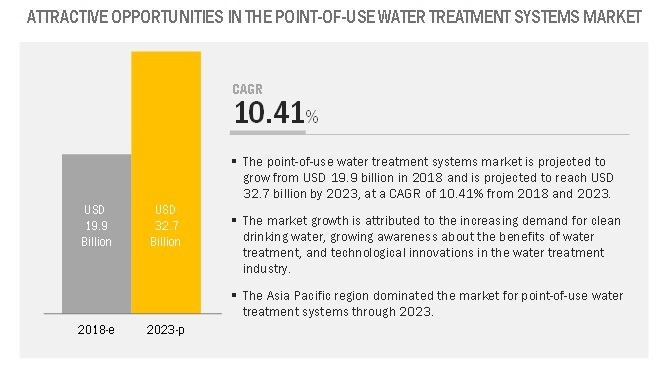 [137 Pages Report] The point-of-use water treatment systems market is projected to grow from USD 19.9 billion in 2018 and is projected to reach USD 32.7 billion by 2023, at a CAGR of 10.41% during forecast period. 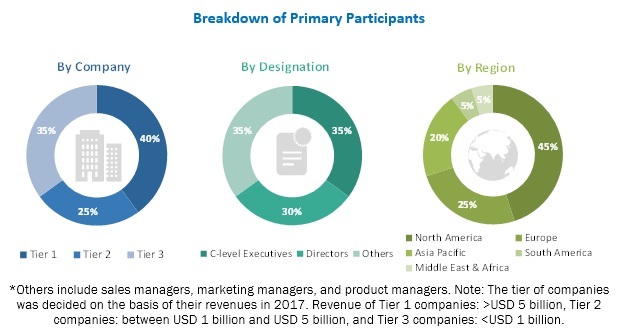 The point-of-use water treatment systems market is growing due to the increasing demand for clean drinking water, growing awareness about the benefits of water treatment, and technological innovations in the water treatment industry. Based on device, the growth of the point-of-use water treatment systems market was dominated by the tabletop pitchers segments in 2018, in terms of value. Increasing demand for tabletop pitchers can be attributed to its low price and ready availability. These devices do not require installation and are available in various sizes and capacities. The residential segment accounted for a larger share in 2018 and is projected to grow at a higher CAGR from 2018 to 2023. The increasing demand for clean water across the globe and limited freshwater resources makes it crucial to treat water for residential and non-residential applications. Increased awareness about the benefits of using clean water for drinking and cooking and water contamination related issues among consumers are factors driving the point-of-use water treatment systems market in residential applications. The Asia Pacific is projected to be the fastest growing region in the point-of-use water treatment systems market, in terms of value and volume. Key factors such as rapid urbanization, growing awareness about water purification technologies, growth in the middle-class population, and the rise in disposable income are projected to drive the demand for point-of-use water treatment systems in the Asia Pacific during the forecast period. North America is projected to follow the Asia Pacific, in terms of demand, with the US accounting for the largest market share of 85.7% in the region in 2018. Key players operating in the point-of-use water treatment systems market include Honeywell (US), Pentair (UK), Panasonic (Japan), Unilever (UK), LG Electronics (South Korea), Coway (South Korea), BWT AG (Austria), Toray (Japan), Brita (Germany), and Alticor (US). Toray Industries’ strong business portfolio coupled with its focus on innovative technologies contribute to its significant position in the point-of-use water treatment systems market. Its strong foothold boosts its market position globally. The company continues to target opportunities in emerging countries, such as India and China, to take advantage of the rising disposable income of consumers in these potential economies. In February 2015, 3M acquired Polypore International (US), which is a manufacturer of membranes and modules for filtration, for USD 1 billion. This acquisition enabled the company to add new technologies to the existing water treatment systems of 3M. In January 2015, Best Water Technology (BWT) AG acquired Mettem Technologies Group, Russia, which was a market leader in the table water filters market in the country. This acquisition strengthened Best Water Technology (BWT) AG’s market presence in the Russian water filter market. In March 2014, 3M introduced the Reverse Osmosis drinking water filtration system in the market. This under-the-sink system is tested and certified by NSF International against NSF/ANSI Standards 42, 53, and 58. Which regions offer immense opportunities in the point-of-use water treatment systems market? What are the upcoming industry trends for point-of-use water treatment systems? What are the high-growth segments in the point-of-use water treatment systems market? What is the competitive scenario in point-of-use water treatment systems market? The study involved four major activities for estimating the current market size for point-of-use water treatment systems. Exhaustive secondary research was done to collect information on the market, the peer market, and the parent market. The next step was to validate these findings, assumptions, and sizing with industry experts across value chain through primary research. Both top-down and bottom-up approaches were employed to estimate the complete market size. Thereafter market breakdown and data triangulation were used to estimate the market size of segments and subsegments. In the secondary research process, various secondary sources such as Hoovers, Bloomberg BusinessWeek, and Dun & Bradstreet were referred to, so as to identify and collect information for this study. These secondary sources included annual reports, press releases & investor presentations of companies, white papers, certified publications, articles by recognized authors, gold standard & silver standard websites, food safety organizations, regulatory bodies, trade directories, and databases. Various primary sources from both, the supply and demand sides of the market were interviewed to obtain qualitative and quantitative information. The primary sources from the supply side include industry experts such as CEOs, vice presidents, marketing directors, sales professionals, and related key executives from various key companies and organizations operating in the point-of-use water treatment systems market. The primary sources from the demand side include key executives from the end-user industries of point-of-use water treatment systems. After arriving at the overall market size from the estimation process explained above, the total market was split into several segments and subsegments. In order to complete the overall market engineering process and arrive at the exact statistics for all segments and subsegments, the data triangulation and market breakdown procedures were employed, wherever applicable. The data was triangulated by studying various factors and trends from both, the demand and supply sides. To analyze competitive developments such as mergers & acquisitions, new product launches, agreements, collaborations, and joint ventures; and expansions in the point-of-use water treatment systems market. This research report categorizes the point-of-use water treatment systems market based on device, technology, application, and region.